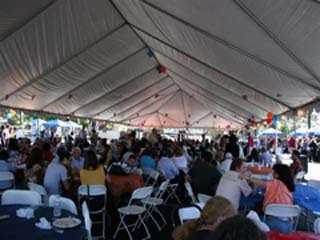 October 9th proved to be the day for the Third Annual St. Mary Food Festival! After a week of terrible weather, the temperature was pleasant, the sun was shining, and the people were smiling. More than 1,200 church members, community members, friends, and family joined together under a 4000 sq. ft. tent, for fellowship and to experience the delightful sights and sounds of the festival, taste the delicious homemade food and enjoy the outstanding music and entertainment. even had Balboa Ice Cream bars. Children took great pleasure in face painting, carnival games, bounce house, slide and playing with their friends. 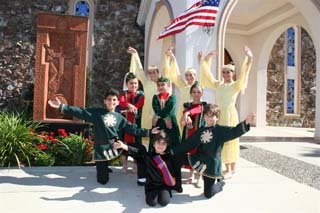 Our Zvartnots Children’s Choir and Dance group entertained the crowd with traditional Armenian songs and dances. Music was provided by Tom Bozigian and his band. 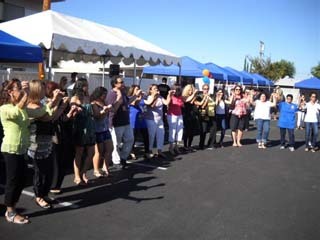 His folkloric dance music even inspired St. Mary’s Adult Dance Class, under the direction of Simon the instructor, to demonstrate Armenian line dances.Vendor booths featured our own Cultural Booth with books, CDs, DVDs, and artifacts; others included a variety of beautiful jewelry, clothing, fruits and nuts. We also held a 50-50 Raffle. Kotayk Armenian Lager Beer was a big seller, as was our take – out booth, where festival goers could take some of the foods home with them. 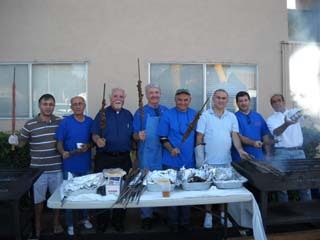 Karakesisoglu, Gevork Martirosian, Kris Mirzayan, Tony Markarian, Armenak Balian, Michael Hollis, Gevork Martirossian, Saro Semercian, Rosie Gharadaghian, Christeen Amloian, and Ara Calibasi. The festival was made possible in part by generous donations and sponsorships, and many hours of volunteer service before and during the festival itself.